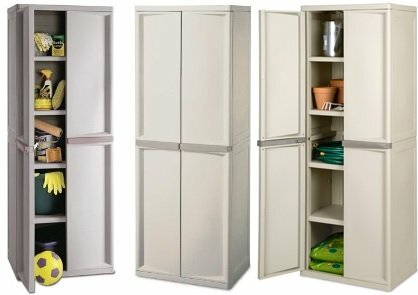 This is the summary of consumer reviews for Sterilite 4-Shelf Utility Storage Cabinet, Putty 01428501. The BoolPool rating for this product is Excellent, with 4.70 stars, and the price range is $72.50-$100.00. 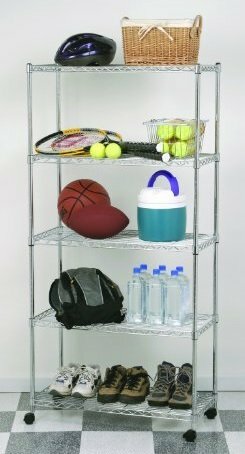 Sterilite 4-Shelf Utility Storage Cabinet is a very functional storage unit with four shelves that can be adjusted to multiple heights. It is made of heavy-duty plastic and can be assembled in a short period of time without tools. 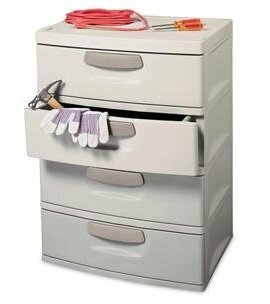 This cabinet provides ample space for supplies and equipment in your garage, basement, and laundry or hobby room. It features doors that swing open easily, close securely and can accommodate a standard size padlock for securing your items. The weight capacity of each shelf is 40 pounds. Users like that they can store items off open shelves to a closed storage that can be moved and the design is very smart, sleek that looks neutral and good. Many reviews have mentioned that they are a little disappointed with the shelves as they are rated to handle 40 pounds, but sag when used for heavier supplies. The bulkier lot is better handled on the bottom shelf. 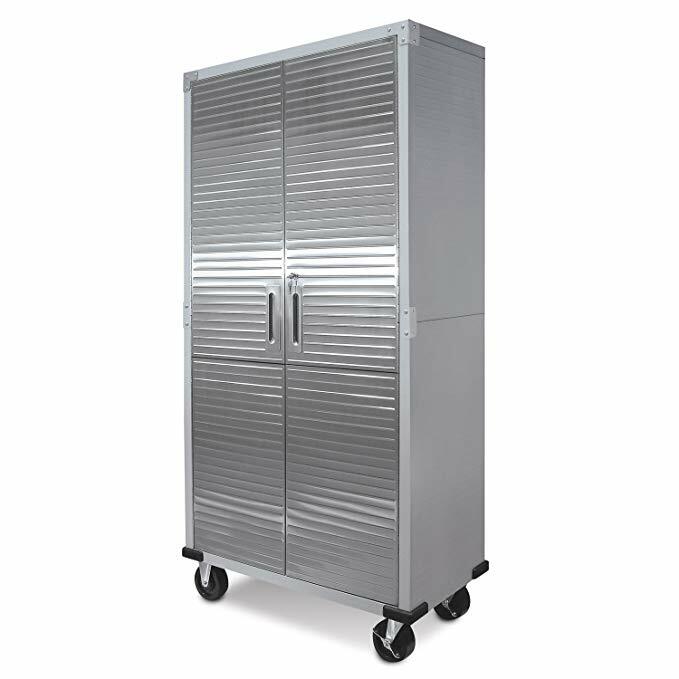 All in all, Sterilite 4-shelf is an elegant and durable light duty storage cabinet. 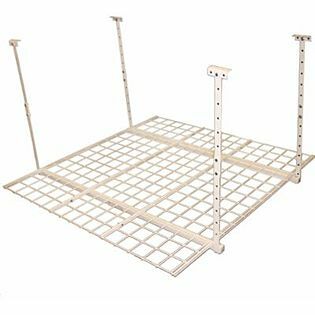 This is perfect for your organizing needs as it is easy to move, easy to use, and easily organized. 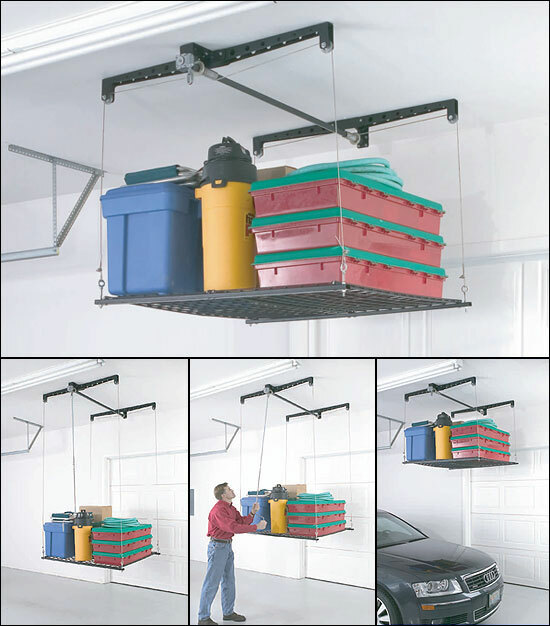 The Sterilite cabinet line allows easy and cheaper way to organize your garage or any area and due to its light subtle color it makes storing things very presentable. Holds all my laundry and cleaning supplies, and it looks nice and clean. This cabinet goes together easily, it well built and stores a lot of my laundry and cleaning supplies but has doors with locking capability to keep my puppy from getting to any of the chemicals. Used for storing dog and cat foods and treats, another for home paper and cleaning supplies. It can be put to good use for any outside project like for your gardening supplies or pool supplies. I use it to keep cleaning products out of reach of little ones!. Same price as the store and I didn't have to go lug it, just had it delivered to my front door. Strong and easy to clean....bought the bundle of two which was cheaper than buying two separately and got $20 gift card bonus! I use it on my patio for my outside supplies, like cups, dishes, napkins, salt, pepper, sugar, and everthing else I need at my hands, rather than running inside to get it. It even has a hole to put a lock and key if you need that. I bought 1/2" electrical metal tubing at Lowe's, cut it the width of the shelf and put two pieces in each shelf. They're quite large and hold a lot. Snap-together assembly, no tools required; light enough so that I can move it around but sturdy for heavy-duty use and holding heavy items. There was water all over the bottom shelf. Well made, sturdy, I can think of so many uses for this great storage shelf. i used only one shelf so my brooms would fit. Each shelf is rated to hold 40 pounds and I can easily believe this's accurate. Had no problems holding the food. We bought one of the two shelf units and two of these bigger ones. It's pretty sturdy, and you can easily customize the distance between each shelf since there's many mounting points. I used it for storing clothes not garden stuff. It's $59.99 at our local hardware store. It's great for storing my clothes. Assembly was snap together, no tools required, and was very easy. I bought 1 for my utility room to store, of all things - seasonal clothing. I bought this because we don't have a garage and needed to store some cleaning products, gardening items, and my steam cleaner. Easy to put together no tools needed. I bought three at my store and plan to buy three more, all going in my garage. I'm currently using it to store my military gear. items we'd on our enclosed porch like chemicals, cleaning items and small gardening items, but still withstand a tad bit of weather when the rain blows in! Definitely not for heavy items. I got these to take care of seasonal items, kids games and school supplies, gardening supplies, and kitchen items that aren't used often. highlight: removable shelves allows you to store big, tall or bulky items. I wouldn't store heavy items like dishes due to plastic tends to bowl over time if heavy loads are placed on them. The item itself is great for my garage. I'm sure this item is great if it fits togther properly. The shelves are adjustable so you can fit short or tall items in them. bought this for gardening and backyard item storage--needed a place to keep things away from our young dog. I don't recommend buying this item. Easy to move, easy to use, and easily organized. Super easy and no tools required. Clean lines easy to put together. Nice size, plastic so easy to clean. Not the case with this unit - when they say easy they really do mean "easy". 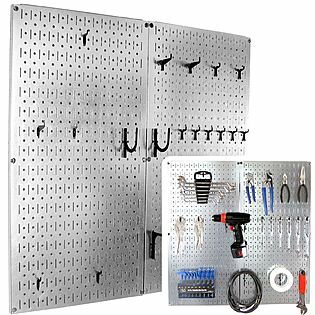 The sterilite cabinet line is easy and cheaper way to organize your garage. It holds lots of items and will be easy to maintain. It's pretty easy to put together but probably for a man would be real easy. Instructions very easy to understand. Very neat looking and strong. Very neat looking and surprisingly strong. It was definately the cheapest of all I looked at and I think the best looking. It also looks nice and fits a lot of misc. Sturdy, simple to assemble, roomy, nice looking, unbelievable price..seen for 2x as much for less a product.. It looks nice and works real well to keep everything together. It now looks new again. I looked around quite a bit before deciding on this one. 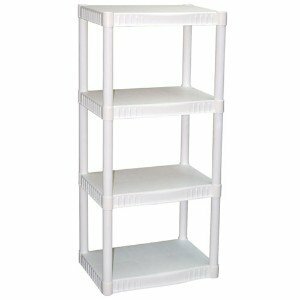 I used these to replace open shelving which looked incredibly cluttered at all times. this's a great product and bc of the light suddle color you can use it on your home and it look nice.